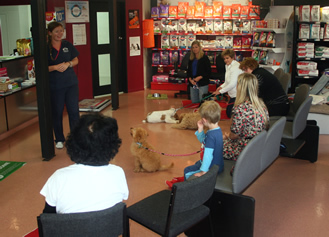 Puppy classes are run most Wednesday nights in our clinic by our trained staff nurse, Bex. Puppy classes should start when the puppies are only 9 weeks of age. 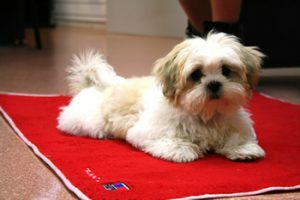 This is simply because puppies have a narrow socialization period between 9 and 15 weeks of age which is when they learn their conditioned behaviours. You want these conditioned responses to be appropriate ones. In other words, they are very impressionable at this age so it is the most crucial time to start their training. Theses classes are all about teaching puppies good manners. These classes are designed to ease the confusion for both of you by showing you which puppy behaviours are acceptable and which are not. We explain what puppies are capable of understanding at this young age and show how positive reinforcement techniques bring out the best manners in a puppy. We illustrate how their so-called “naughtiness” or disobedience is just a miscommunication and show puppies will strive to be good citizens if only we can show them how. You can ring us on 5757 688 and we will be able to tell you when the next puppy course starts. These classes are run in the clinic on Wednesday nights starting at 6.30pm. They are a fun way for both you and your pup to get off to the best start and the pups themselves get to play and interact with the other puppies there. You will receive advice on toilet training, lead walking, nutrition and exercise etc. etc.